The biggest reason for an obvious increase in interest with Lincoln Park lately is the incredible transformation of the 3 city blocks surrounding our light rail station at 10th & Osage. 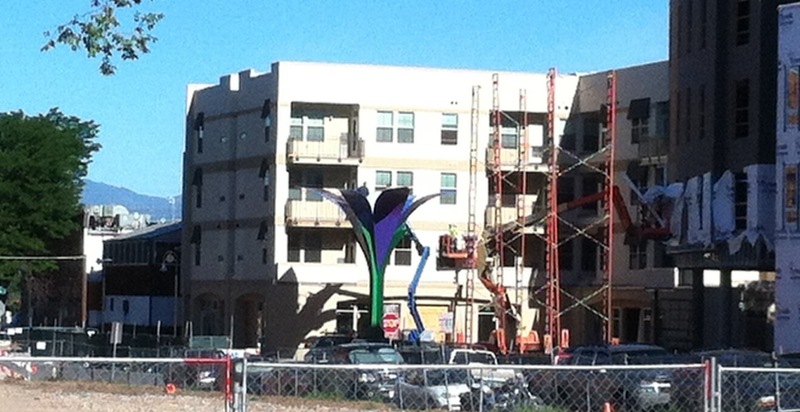 The raising of the flower sculpture this week (a creation of a local artist and pictured above) marks a milestone towards completion of Phase II. DHA has shown incredible leadership throughout the journey to redevelop South Lincoln Homes, which involved a nearly unprecedented effort to engage the community in the redesign. I hope to explain briefly why the project is going to benefit the greater Lincoln Park neighborhood, but I also want to offer more background to highlight the goals that guided the process and clarify expectations for what is coming. I want to begin by mentioning what a unique opportunity that existed with this location. As Denver continues to expand its light rail network, existing stations, such as ours in Lincoln Park, only become more valuable as the entire system becomes more useful to travel to more destinations. However, until the redevelopment got underway, Lincoln Park remained off the radar for home seekers, despite the obvious advantages such a transit-rich location offered. We can debate policies and cause and effect all day long, but evidence suggests that concentrations of poverty, as perpetuated by housing projects across the country, are not the best way to achieve healthy and positive outcomes for both residents and surrounding communities. Rather than squeezing people from their homes slowly, as gentrification inevitably does through rising property values, the project proactively preserves affordable housing with transit options for families and workers. We have taken the leap: If we agree that preserving affordable housing is helpful to creating strong communities, preserving transit options for all incomes is important, too. La Alma/Lincoln Park is a city neighborhood, and a community begging for more retail and restaurants. The path for sustainability for more businesses is more customers. The vision of a mixed- use development is to increase the number of units, with diverse layouts that appeal to a mix of residents. The vibrant scene at Mariposa will eventually create the market for the retail we city dwellers would patronize. There will be at least a one for one replacement of affordable units within the development, but 90% will be residents that choose to pay the market rate for the desirable location and amenities. A lot of time and effort went into making the design as strong as it could be. Remember that the buildings designs were ambitious, but constrained by budgets, of course. The redevelopment, and DHA, owe much to the US Department of Housing and Urban Development, because without the awards from the stimulus and Hope VI grants, as well as the Section 8 program, none of this would be happening. Temper your expectations if you thought that this was all about speeding up gentrification. So, Phase 3 is looking almost done on the outside, and 4 is about to break ground on the cleared block across the street. Phase 5 is designated as a section of Mariposa south of 10th, in cooperation with Habitat for Humanity. Phase VI design kicks off with a neighborhood meeting on the 24th. I’ll see you there, Neighbors.